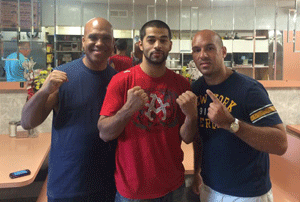 Dr. Pietro Baio with Sadam Ali and trainer Andre Rozier. 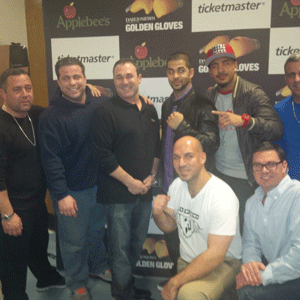 This past Saturday night Canarsie Native and 2008 Olympian Sadam “World Kid” Ali fought for the first time on HBO. He was the co-main event on the Bernard Hopkins VS Serge Kovalev card in Atlantic City. Sadam was put in with the tough Argentinian , Luis Carlos Abregu. Abregu had only one lose going into the fight , which was a UD lose to Timothy Bradley. Many fans and critics believed Sadam was in over his head when the fight was signed. The “World Kid” Proved everyone wrong when he won by TKO and even dropped Abregu in the 6th and 9th round. This win easily puts Sadam in the top 15 if not the top 10 in the welterweight division. We will surely see Sadam again in the first quarter of 2015, hopefully in a big fight right here in Brooklyn.